It’s a good year for drum-based rhythm games. Hot on the heels of the wonderfully quirky Gal Metal for the Switch, Bandai Namco’s released two new Taiko no Tatsujin drum games, one for Nintendo’s console and one for PlayStation 4. Which one to get depends on which sort of rhythm gamer you are. 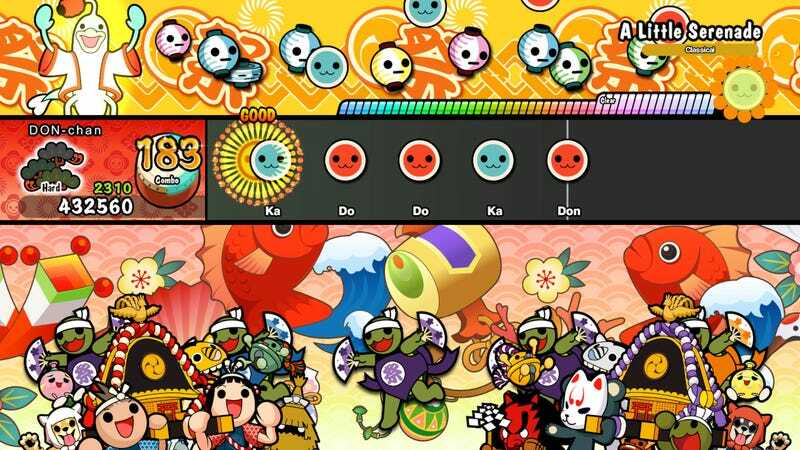 Taiko no Tatsujin is a long-running series of rhythm games in Japan. Annual installments have been popping up in Japanese arcades since 2001, bright and colorful machines with plastic drums sprouting from the front. Players grab a pair of drumsticks and beat the taiko drum in time with music. Red notes are the face of the drum, blue notes the rim. Outside of arcades, Taiko No Tatsujin has had various home console, mobile and handheld appearances, though mostly in Japan. But rejoice, drum masters, for the latest two installments have arrived stateside, and while neither is bundled with a drum controller (boo), both Drum ‘n’ Fun for the Switch and Drum Session for the PlayStation 4 are a good time. In fact, they’re two different sorts of good times. While both feature a large selection of songs—anime tunes, Japanese pop, classical and video game music—the track listing, features and overall focus of the Nintendo Switch and PS4 games differ greatly. The PlayStation 4 version of the game focuses on mastering solo performances. Each song features a bingo card of goals to achieve while playing—getting a certain number of good hits in a row, overall score, that sort of thing. Once a song is complete, spots on the bingo card are revealed. If a player scores three in a row on the bingo card, they get a coin. Coins are used to unlock costumes and titles for the game’s characters, another feature unique to Drum Session on the PlayStation 4. In the video below, you can see my Hatsune Miku-dressed Taiko character performing “Try Anything,” the main song from Disney’s Zootopia, in Japanese. The track listing for the PS4 version also includes “Let it Go” from Frozen, also in Japanese. So good. Of the two versions, the PlayStation 4 certainly feels more full-featured. It’s got a whole online mode where players can enter tournaments (once they complete five qualifying rounds), winning points to secure special items and titles. Rather than live matches, players compete against other players’ ghost performances, so lag is not an issue. The PlayStation version is also the only one with guest characters who show up to play along. I’ve played songs with Heihachi Mishima from Tekken, Hello Kitty and vocoloid sensation Hatsune Miku. The Nintendo Switch version of the game, Taiko no Tatsujin Drum ‘n’ Fun, doesn’t feature guest characters, dress-up or online play, but it’s got other charms. Like the ability to use the Joy-Cons as drumsticks, swinging straight down for red and diagonally for blue. The Switch version has a livelier intro screen too. And while there is no online multiplayer, there are a ton of multiplayer mini-games for up to four players to enjoy. They mini-games are a big focus here; completing them can unlock new songs and characters. There’s a wide array of games available. Players climb giant cakes, pound mochi, dance in a circle, jump rope, perform Kabuki and much more. It’s more of a social game, Drum ‘n’ Fun, built around players getting together in person and doing silly things. It’s certainly the more Nintendo of the two versions, right down to special musical appearances by Kirby, Splatoon and Super Mario Odyssey. The Taiko no Tatsujin series has been charming gamers since 2001, with its silly characters, on-screen spectacle and—when a drum controller is handy—satisfying percussive action. Drum ‘n’ Fun for the Switch and Drum Session for the PlayStation 4 continue the tradition. Best of all, they’re different enough that if you’ve got the means to pick up both of them, you won’t be disappointed.